On November 12-13, 2016, KSCA staged its first major event: Futurelands2. 130 people from across Australia listened, talked, mingled and dined between the Kandos Community Hall, Marloo Farm and the extraordinary pagodas of Ganguddy/Dunns Swamp in the Wollemi National Park. Innovative farmers, Indigenous historians and land custodians, soil scientists, economists, writers and artists explored emerging practices in farming, land care, food and energy production. Futurelands2 provided KSCA with an amazing platform to share The Hemp Initiative and the ideas around Cultural Adaptation with a remarkable crowd of speakers and attendees from both rural and urban Australia. 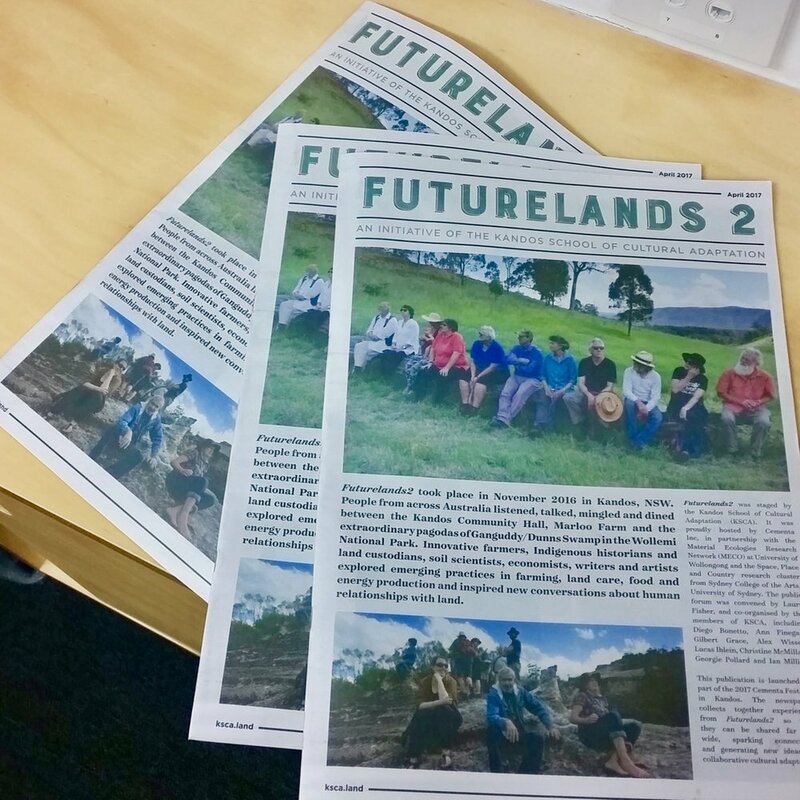 The talks and ideas from Futurelands2 were compiled in the Futurelands2 newspaper, which was launched at Cementa 17. Futurelands2 was staged by the Kandos School of Cultural Adaptation (KSCA). It was proudly hosted by Cementa Inc, in partnership with the Material Ecologies Research Network (MECO) at University of Wollongong and the Space, Place and Country research cluster from Sydney College of the Arts, University of Sydney. You can revisit the Futurelands2 program here, as well as the speaker biographies here, the art that was on show here, and each of the Futurelands2 talks on video here (and at the KSCA youtube channel).